It’s here. The long-rumored 3D phone from Amazon called the Fire Phone, has finally arrived. While some say that the phone is nothing more than Amazon’s move to make more money, others say that it’s simply amazing. The phone goes on sale on 25th July in America, and worldwide launches will soon follow. Only time will tell if Jeff Bezos hit jackpot with the phone. Till then, here are 10 things you must know about the Fire Phone. Since it’s an Amazon phone, selling stuff on Amazon is its top priority. And for that, there is a dedicated button on the phone called Firefly. Just press the button and the phone will hear what you hear, see what you see and will accordingly, suggest you what all to buy. Firefly not only scans product barcodes but also songs, random things you see, and even whatsoever you generally talk about. For example - if it hears Game Of Thrones, it will display the IMDB rating of the show and other things related to the show. For the record, Firefly can recognize 245,000 movies and TV episodes, 160 live television channels, as well as 35 million songs from the Amazon Music catalog. The Fire Phone has cameras all over it. Not for you to click pictures though, but to track your head’s movement. In addition to the main front-facing camera, four more depth-sensing cameras have been embedded in the front panel. Only 2 out of the four are actually used for 3D imaging, while others act as back up when your hands cover the mains. It also has infrared sensors so as to ensure tracking in darkness. There is no word about its usage thus far, but we are expecting nothing short of an awesome new feature. Amazon thought that using fingers to navigate through the contents is passé, which is why they went the touchless way! All you have to do is tilt the Fire Phone in different directions to see more information from apps, play games, resize images and scroll through webpages without having to touch the screen even once. Moreover, the things you move around by tilting the phone looks as if they were real physical objects in front of you. Also, apps, documents and games can be simply called out to get started. Here’s another feather in Fire Phone’s cap. The Fire sports a 13 MP camera coupled with a fast f/2 aperture lens that Amazon claims is notches beyond iPhone’s camera. Also, there is optical image stabilization and free unlimited photo storage on Amazon’s cloud service. The front camera is 2.1 MP. Both the front and rear snappers support 1080p HD video recording at 30 fps. Sounds surprising, doesn’t it? Yes, the Fire Phone will come with earplugs that are supposedly tangle-proof with flat cables and magnetic buds that stick together. Also, the phone sports two stereo-speakers with Dolby Digital throwing out surround sound. Amazon introduced an online troubleshooting feature for the Kindle last year called Mayday. This features is available on the Fire Phone as well. It’s a free 24/7 tech support line that Amazon promises can be reached within 15 seconds from the device. The service works equally well on Wi-Fi and data connections. Just like the Kindle, the apps on Fire will show a tiny preview of each app underneath when you tap on them. For example: you can check how many mails you have sent or received. Amazon has also asked the developers to build their own Active Widgets, so a lot of amazingly interactive widgets can be expected. 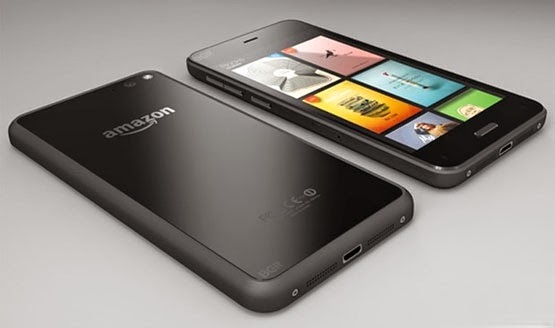 Amazon has introduced an Apple AirPlay-like feature called Second Screen with the Fire Phone. The feature lets you transfer content from one screen to another just by a simple swipe. Also, another interesting Kindle feature that has been carried on to the Fire Phone is the X-Raying feature. X-Raying lets you know about an artist simply by clicking on his face in a video or in a movie you are watching. The Fire is propelled by a quad-core Snapdragon 800 CPU mated with 2GB RAM paced at 2.2GHz and also supports an Adreno 330 GPU. Also, it runs Fire OS 3.5, a tweaked version of Android JellyBean 4.2. Surprisingly, Amazon has tweaked Android beyond recognition and it’s hard to call it Android anymore. Google services will also be excluded from the OS. While the phone goes on contract sales at a price of $199 (32 GB) and $299 (64 GB) in the US.